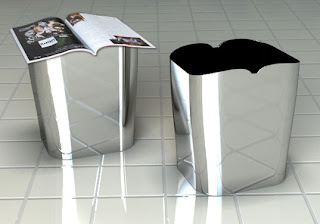 One of the most popular posts on this blog has been on "upcycling" - designs which reuse components in more valuable and sophisticated ways, rather than "downcycling" into progressively lower-quality uses on the way to the landfill. Well, here's another one! Through Gizmodo, this nifty little kit transforms the packaging for an iPod Nano into a teensy speaker set for the iPod. The idea is neat; the reality is a little more sobering. Who will actually use speakers of this quality (tiny speakers can't reach any bass) and low power (they're unpowered, so it'll be a whisper at best), other than to show off how eco-savvy they are? Ironically, once the novelty is over, the packaging and the speakers will end up in the landfill - a greater hit to ol' Mother Earth than if the packaging had been tossed in the first place. Just because an idea is buzzworthy and inspiring doesn't mean it's ready to follow through on its promise! 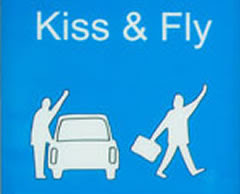 While traveling to Minnesota for Thanksgiving, my fiancee noticed a new sign at the San Francisco airport: Kiss & Fly. Before even learning the details, I could tell this was a good bit of user-centric design: people like to take a little extra time to drop off loved ones, but the hustle and bustle of the main airport dropoff lanes don't take too kindly to that kind of lollygagging. Hence, the Kiss & Fly area, which is removed from the lanes that need to keep moving but provides passengers immediate access to trams or shuttles. It's just like another airport innovation from a few years back - the "cell phone waiting lot." And just like Kiss & Fly, it speaks for itself! I've blogged about some design "bandaids" before - workarounds for design failures such as the snipped-headphone mute for laptops, or the actual-bandaid microphone wind guard. 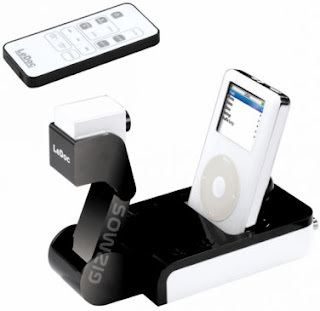 This one takes it a bit further, to an actual commercially-available product from Acme Research, which puts your iPod screen on your TV by shooting it with a video camera. Whether this is a necessary workaround intended for iPods for which video can't be output via cables, or whether this is the lazy/stupid/Rube-Goldberg way to remain ignorant of that function, I don't know. Either way it's something of an abomination - but at least good for a laugh! Bonus: you'll be broadcasting everything on your iPod screen - not just the content, but fingerprints, scratches, dirt, and grime. Enjoy the show! 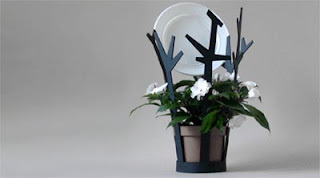 A neat do-it-yourself design from Make Magazine, the Dish Drainer Project puts water from drying dishes to use in a potted plant. This reminiscent of the water conservation in the previously-posted toilet-top faucet, but let's face it, a little less off-putting. Besides, it's an excuse to get an additional potted plant in the home - which adds beauty, oxygen, and "good karma," for whatever that's worth. What's best about the design is that it doesn't even look too foreign to the plant itself - those spokes look enough like plant branches to fit in. Beauty and usability, plus conservation and household greenery... not bad! Ready for some links? Here they come: Mark Hurst of the Good Experience blog and Bit Literacy book reports on a CNN story about social-networking underdog (at least in America) Orkut trouncing leaders MySpace and Facebook in certain markets like Brazil and India. (Whew!) So, why would this happen? Is it a cultural-style-and-taste thing, where maybe everyone doesn't like the obscene bells and whistles Americans tend to splash all over their pages? Nope, it's simpler than that - those exact bells and whistles make MySpace (especially) and Facebook (now that it's open to outside apps) much larger pages in terms of data. It turns out that Brazil and India have much lower average internet speeds - 15kbps, about what AOL users had in the US in 1990, according to the CNN article. Therefore, Facebook and MySpace take infuriating minutes to load a single page, while Orkut comes up relatively quickly. Setting aside what comments I might make about the usability of too-highly-customizable webpages (and especially regarding the monstrosity that is MySpace, I'd have a lot! ), it seems that an important lesson is this: usability doesn't just depend on the most appealing ideal design, but on making the right technologically-influenced decisions so a design can actually function in a non-ideal world. In this case, dropping some bells and whistles to make a faster-loading site seems to be a no-brainer for user satisfaction. Some markets aren't looking for the best website in any category - they're looking for the lightweight champions! 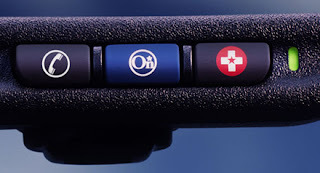 Engadget reports a new feature coming to 2009 model-year cars with OnStar, called Stolen Vehicle Slowdown. Basically, a stolen car can be located with GPS - and once it's been tracked to within sight of the cops, OnStar can remotely cut the engine power, bring the car and its thief to a stop. No high-speed chases, just quick and in-your-face justice! This anti-theft feature is reminiscent of the previously-blogged iAlertU for Mac laptops, which snaps a photo of a would-be thief in the act and emails it to a pre-set address. It's not just preventing theft, or recovering what was stolen - it's a "gotcha!" moment where the rightful owner gets a feeling of personal revenge over the thief. Products are designed to appeal to all kinds of emotions in consumers - but revenge is a fascinating one indeed! There's something about the perceived practicality of a product which adds to its value - that is, if the user can easily rationalize the product in terms of saved space, saved energy, or any other "more for less" way, it'll be much more satisfying to use. This psychological effect can exist even if the perceived value doesn't really exist, or if it's offset by larger inconveniences. With that prelude, check out the The Natural Wave, from designer Byung-seok You at Yanko Design via BoingBoing Gadgets. 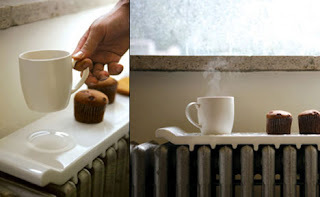 This ceramic plate is designed to fit on top of and use the heat from old-school steam radiators, in order to keep your hot drink and pastries toasty. 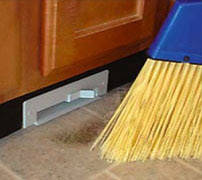 Perceived to be practical and/or efficient? Definitely. Actually practical? Well, that depends on a lot of things: the shape of your particular radiator matching the fins on the underside of the Wave, the radiator actually being on a heating cycle when you're looking to use it, the radiator and atmospheric conditions interacting with the plate's thermal mass so that it's hopefully at the right temperature for use, and of course, where the radiator is located in your house or room. It's a lot of things to have to get just right - but when you do, I bet there's a wonderful perceived practicality and added value to the product! In part 2 of our look at convergence, here's something a bit useful, but a bit unnerving as well: this is BevyTech's Gadget Bottle (via Engadget). 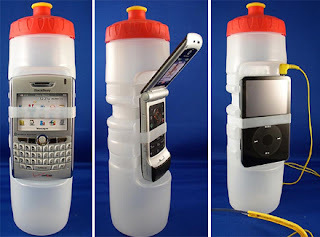 It's a normal water bottle, except for the recess and strap intended to make room for and retain an electronic gadget of your choice. And you know what, this actually makes sense! When you're running or biking, these are two of the heavy, bulky items you likely want to have on you and readily accessible. Why not combine them to make one thing to carry instead of two? Of course, the answer is that never-happy duo of electronics and water. It's difficult to discard the vague notion that somehow, in this close proximity, the two are going to mix. I'm not really sure how... but somehow, it's bound to happen! So, this may be a very usable design - but fear can trump usability any day. One more convergent contraption coming up next! "Convergence" is usually understood to be a good thing: combining features commonly used in similar situations into a single device, to increase convenience and efficiency. Cell phones and PDAs have finally converged into Treos, Blackberries, and iPhones; home printer/scanner/copiers have come together, too. 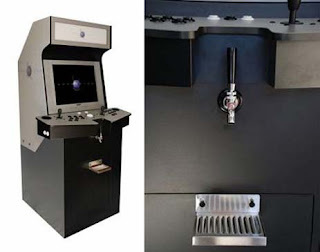 But sometimes convergence can be taken too far - there's no real reason to actually combine the unhappily-mated products, and the result performs poorly in all of its functions. 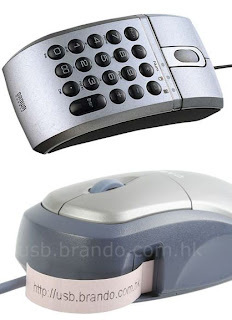 Today, two computer mice definitely take convergence too far: these rodents were bred with calculators (Sanwa, via Gizmodo) and label printers (Casio, via Engadget), and the offspring ain't pretty. The calculator at least has a glimmer of reason - less distance to move your hand in order to make quick onscreen calculations - but the sacrifice in ergonomics (and accidental calculator keypresses?) more than obliterates it. And the label printer is simply ludicrous - there are better label printers, and better mice, and no reason to slap them together! iPod Deathclock: Upper or downer? The iPod Deathclock is a website which, after inputting your iPod serial number and usage patterns, purports to use some fancy math to determine just how long your musical buddy will live. 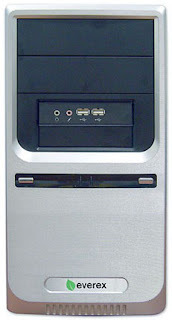 The accuracy of something like this is, from an engineering standpoint, probably horrible. But for a user, it's a date that will enter the mind and most likely never leave. The question is whether this quantification of the iPod's mortality is a bummer or a pick-me-up. It could be a bummer because, hey, you just dropped hundreds of bucks on this thing, and it'll only last until then? On the other hand, it could be a date to look forward to, because on that date you'll have to upgrade to the shiniest new one on the market. 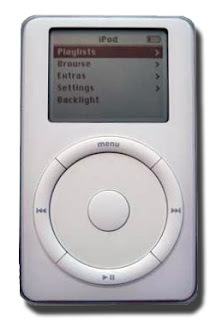 The perception of the quality of the iPod itself is also affected, seeming either to be either a junky thing that doesn't last or one of an exciting series of products that will just keep improving. There have been a few backup- and blindspot-cameras available for cars for a while now, but nothing has really caught on. 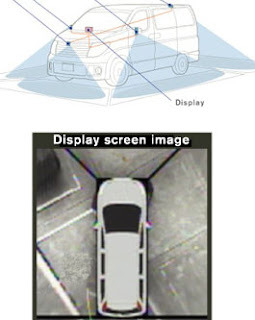 But Nissan's Around View Monitor (via Gizmodo) might have what it takes for a more mainstream adoption - the innovation is that it synthesizes images from several cameras (top image) into a virtual above-car view (bottom image). It's almost immediately obvious how this could help in more ways than checking blind spots: making sure you can swing that u-turn, confirming you're centered in that parking spot, or helping with the always-daunting task of parallel parking. And if there's a dog somewhere in there, you'll catch that too! 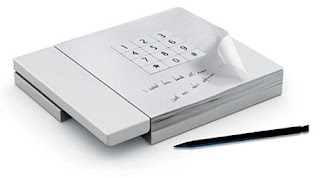 PRO: It puts a memo pad right where you might need it, if you're scrambling to get down some info on a hastily-answered call. CON: Much of the writing space is virtually unusable, since writing in the upper and left areas would cause your hand to mash the keys, making a symphony--no, cacophony--of tones for your unfortunate listener. CON: This makes the aforementioned unusable paper a nasty waste - very non-green! CON: Just to nitpick, ID folks never seem to make phones look like phones. Especially the handset - if this thing were ringing, I might not know quite where to "pick it up!" CON: ...And who uses landline phones like this anymore, anyway? Looks like this one fails by a score of 4 to 1. But one good idea isn't bad! 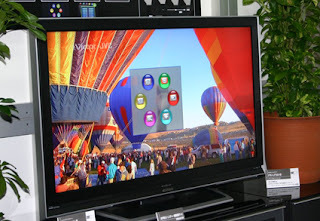 Gizmodo reports that at JVC recently showed off a television which can be remote-controlled by hand gestures and claps. Just the basics - volume, channel, maybe mute or pause - all detected with a small camera and microphone. The implementation is important (if it's unreliable, the system could be infuriating), but the idea is fascinating from a usability point of view. No more searching for the remote, or even keeping it out all the time (they can be eyesores). On the other hand, control can now be shared among all viewers simultaneously, which is a brave new world in the home-theater milieu - will there be power struggles? Or will the original purpose of the remote control, the elimination of any physical effort whatsoever, win out and result in everyone being too lazy to life a finger...?